SPEEDWAY: In an action packed night of speedway Josh Harm won his first Queensland production sedan title. The 40-lap final was a tight affair with side by side racing throughout. Harm took the lead five laps into the final and although pressured, controlled the race to the end. 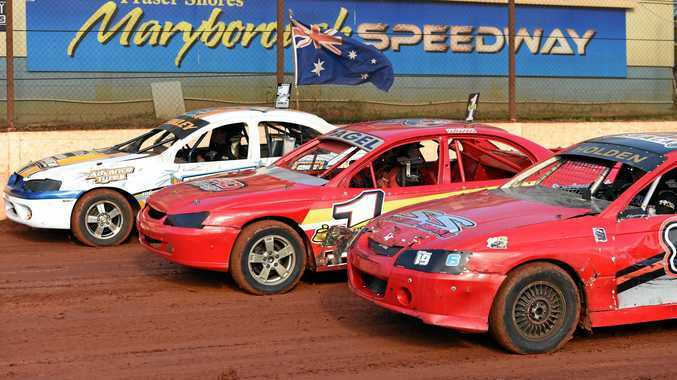 Maryborough Speedway president Wayne Moller was thrilled with the night's action. "The racing all night in each category was fantastic,” Moller said. "Our track was the best it has been for a year or more and it showed with the racing,” he said. "I want to congratulate Josh on his title,” Moller said. He was also high in his praise of local racer Joel Berkley who had a challenging night before finishing third in the final. "It was without doubt the best drive on our track this year ” he said. "Due to difficulties Joel did not finish the heats and started in last place in the B final, Moller said. "He then passed the 15 cars ahead of him to win the B final and advance to the final,” he said. "Joel just ran out of laps in the title race,” Moller said. In the Top Star junior class the racing was close all night. "You could have thrown a tea towel over the top six drivers,” Moller said. At times in those races, cars were running three or four abreast. "It is a credit to the skill of the young racers,” he said. Braith Hogan finished the close racing in first place ahead of Kurtis Peall and Mitchell Pammenter. Josh Pokarier was successful in the Formula 500 race. In the Kenco New Stars junior sedans it was Jaidin Santin and Jayden Hancock who were the stand-outs. The next Speedway meeting to be held in Maryborough is May 4-5 with the Formula 500 and Wingless Spring Car State tiles as features. Super sedans are part of the program with the East Coast Classic. The Wide Bay Junior Sedans title will also be up for grabs. For the old speedway fans they will have the opportunity to see the Nostalgia sedans in action.